For those of you not on my Facebook feed, I have been posting updates and anecdotes daily about our journey home and bringing Abi into our family. I decided to copy and paste them into a post here, in case Facebook doesn't save them. I'd like to remember this time, both the good and the bad, and our experience may help others who are also adopting internationally. I know I have been tremendously encouraged by reading the blogs of other moms who have gone before me. The language barrier seems to be a huge deterrent to her, as she loved to talk to people in Ethiopia, whether she knew them or not. I am sure she will be that way here once she understands what people are saying to her. At this point, she speaks about 5 words of English, and can count to ten. Matt and I speak about 400 words of Amharic, which is enough for the basics and a little fun stuff, but not enough to translate conversations. I am sure she'll pick up English really fast, though. FAQ, so hopefully I won't have to answer the same questions quite as many times! 1. Age: Abi will be 4 in March. 3. The adoption is final, but we need to do a little more legal stuff and change her name. Her American name will be Elizabeth Joy, but we'll still call her Abi (Ah-bee) for short. 4. She is already bonding to us and knows we are her family. I'm impressed how much she knows in such a short time. 5. The trip and flights went well, for the most part. When I get time, I'll blog about them. 6. Yes, we're planning a welcome-home-party/baby-shower but I don't know when it will be. Local friends who are interested, I will post something when I decide when/what I want to do. I also want to have a cultural show-and-tell party, and I don't know if that will be the same or separate, so stay tuned. ‎7. At this point, she speaks about 5 words of English, and can count to ten. Matt and I speak about 400 words of Amharic, which is enough for the basics and a little fun stuff, but not enough to translate conversations. I am sure she'll pick up English really fast, though. ‎8. At this point, we probably will not maintain contact with her birth family. It's possible we'll resume contact in the future sometime, and she is welcome to do so when she is old enough to want to. We finally just figured out that when Abi repeats "tataba" at dinnertime, she wants to wash her hands before she eats, which is super important in Ethiopia. Oops. Thought it was a food. Thank goodness for curiosity and a good dictionary. Abi asked to go "shinta-bayt" (toilet) so Cody had to be at least as cool as her. He sat on the potty too, and we had success for the first time! Peer pressure works wonders! Roller coaster day. Up at 4:30 with a screaming child. But then watched her eat three scrambled eggs and some calcium-fortified OJ and rejoiced that she is getting nutritious food at last. We are SO blessed in this country. All morning Taz-Boy alternated between playing with Abi and tearing the house apart in an effort to keep the family's attention away from her and on himself. And my heart melted when she threw her little arms around me and said "Mommy, ewedeshalehu" (I love you). Soon after, my heart broke when she asked for "tata" and we had no idea what it was, so she burst into tears, and so did I. She pathetically begged us for it and we were so clueless. But all was well again when we finally scoured the dictionary and determined that she wanted a bottle of warm milk like Cody gets before bed. We gave her some, and she snuggled down into her bed, so safe and happy and warm. I really need a long nap. This conversation happened last night. Setting: Daddy puts his shoes on to take the garbage out. Time: midnight. Me (attempting to translate) She wants to put on her shoes and go for a ride in the car? Abi: repeat request 467 times. Me (frantically flipping through the dictionary, and in stumbling Amharic) "Tomorrow... Car... You go." Me: "Whew, that was a lot of work!" Very representative of how most of our interactions go. 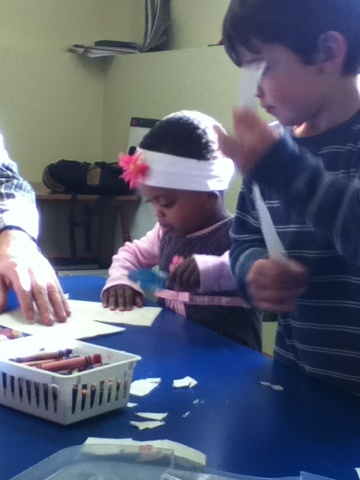 She is learning English words rapidly, though, so hopefully we meet in the middle pretty soon. Oh my gosh, my brain feels like it is going to fall out. I keep thinking the jet lag is going to get better but I am still going to bed at 1am and waking up about 4:30 am. Oi! Jedi-Mommy has once again restored order to the galaxy. Just overheard (in Amharic): "I love you Daddy, for giving me water. Yum, yum, yum." Then she sang a little song she made up about how Daddy gives her Cheerios and bananas (Biscuti inna mooz, Daaaaaddy...) Then, "More water, Daddy?" His reply (in English): "Okay, here's your water, Princess Nut-job." 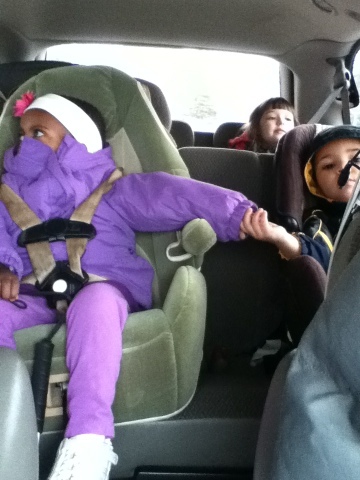 Since day 1, these two always hold hands in the car. Is that cute or what? Whoa, this was really, really good. Written by an adoptive mom to friends and family who want to be a support, but are not always sure what to say or how to help. I just have to add that all of you have been a tremendous support and encouragement to us, and we are grateful for every single one of you! I'm so tired I can't even nap. :( Having a really rough day today. Abi is clingy, Cody is crazy, and we all got just a few hours of sleep last night. Right now the little folks are napping, so I should be able to rest, but I am too wound up. Prayers appreciated. 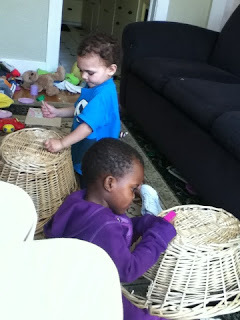 Using "tools" to "fix" the toy baskets. Thanks for all the sweet words of encouragement earlier. Feeling a bit better tonight, thanks to the support of friends and especially Matt. He's the best and I don't know what I'd ever do without him! Took the kids downtown with the big, blue stroller (about 7 blocks). Then home again and Mommy needs a nap more than the littles! But overall, I had a lot of fun, and it was so nice to get out of the house. I feel like we might as well bring along a brass band, an elephant and some balloons. Maybe a fire engine. Reading "Maximum Ride" Book 3. Hooray for YA fiction brain candy! According to our training, I'm supposed to say yes as often as possible, which I would anyway. The times when I say no have no effect and she just continues to ask like a broken record. Add into the mix that the rest of the family cannot even talk to each other over the Abi-requests, and that Cody is equally needy all the time. Does anyone know where I can purchase some Sanity-In-A-Bottle?? It happened again: the overwhelmingly loud noise of everyone talking after church in that echoing room sends Abi into meltdown mode instantly. We know it's not the people as she loves talking to people. We are pretty sure it's the acoustic of the room, which to a blind person probably sounds like surf. We're brainstorming solutions: noise-blocking earmuffs, which may not work as they would function like a blindfold to her. Maybe just go right outside to play and avoid the problem. One of Abi's first sentences in English: "Stop it, Cody!" Linguistic necesseties. I have this cold now too. Kids are whining and fighting. Abi is demanding juice and band-aids and injera and toys and... Dear Lord God, grant me strength beyond my own strength. These are the days that make every other day look good. Wow! Adoption IS sort of like a pregnancy! Complete with postpartum depression! Could've done without that I'm sure!